Landfall made on Brunt Ice Shelf on 6 January by Royal Society IGYE Advance Party, leader David Dalgliesh, on board MV Tottan. The full story here. See Photo. + Watson G.E. (Gus) Chief Scientist, Electronic eng. * George Hemmen did not winter at Halley Bay but did help to find the place and was much involved with it all for a number of years. Raymond, Limbert, Powell, Watson, Le Feuvre, Dalgliesh R, Lush, Dalgliesh D, Evans, Prior. Survey of the Royal Society base, by Evans, Le Feuvre and Powell. Still hanging on the wall at Halley. MV Tottan at Hobart after returning from Macquarie Island, April 1952. 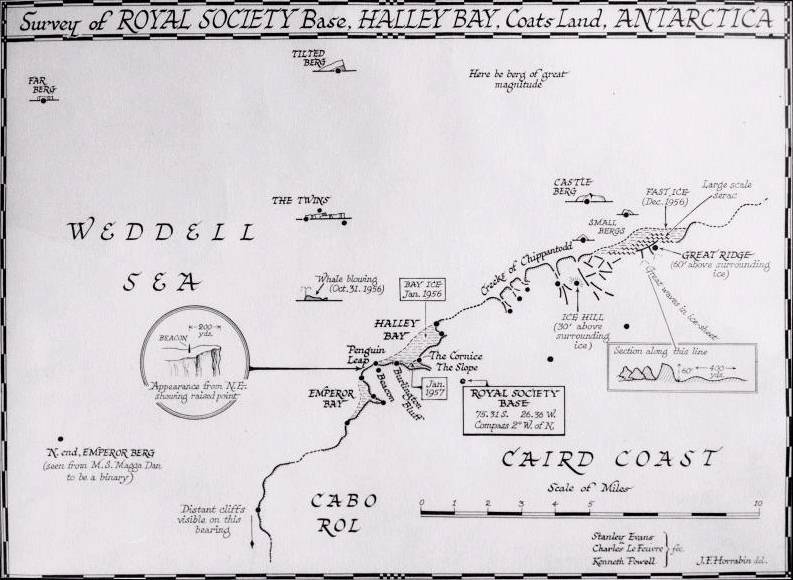 I was responsible for coordinating the logistics and supplies for the Royal Society IGY station and went to Halley Bay in January 1956,1957 and 1959 although I never over-wintered there. 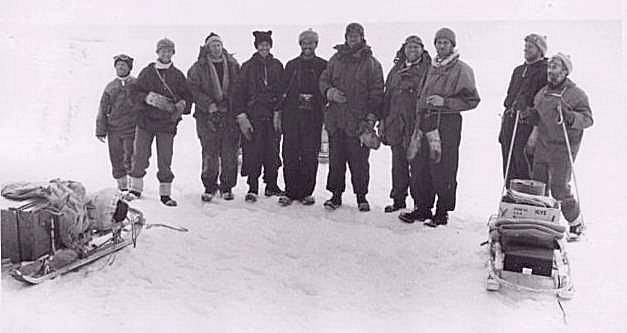 In 1955 FIDS, with the practical backing of The Crown Agents for Overseas Governments and Administrations, had undertaken to organise the logistics for the Royal Society IGY expedition and engaged me for the task. In January 1956 I was one of the three on 'Tottan' (David Dalgliesh, leader, Ken Powell and myself) who, having had previous Antarctic experience with FIDS, formed the party to go ashore to reconnoitre for a site for building the station.It was the third location we tried before finding somewhere that appeared suitable, which subsequently became known as Halley Bay. More. See also: Halley Bay - Base Z - The background and why it is where it is. George Lush, Robin Dalgleish, Johnny Raymond, Doug Prior and the 2 i/c Gus Watson all died some years ago. The radio op Charlie Lefeuvre went to Australia in the late nineteen sixties/ early seventies and hasn't been seen since ( swallowed up in the Bush ! ?). The magnificent IGY hut, built by the Advance Party, boasted a Tudor-style sitting room/bar (the Halley Arms) with imitation beams, imitation brick fireplace, settles and lanterns, all made on base. More.